"Variables Control" dialogue box is called from "Smart Control" panel. In spite of the fact that there are plenty of control elements, "Variables Control" dialogue box is very easy-to-use and, at the same time, has many functions. 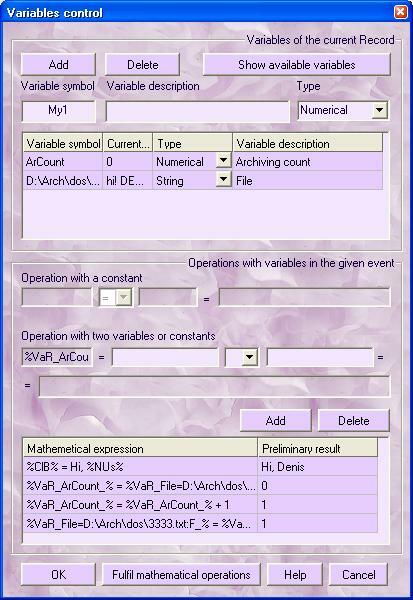 The lower part of the variables control panel, named as , allows to add the needed mathematical operations with variables in the given action. Adjective "mathematical" has a more general meaning, since besides mathematical operations AutoClickExtreme offers the opportunity to save variables into a file, to paste their values from a file, from the Clipboard, etc. For example, if you want to introduce an operation with a constant, you should make a right mouse button click in the corresponding editing field and choose the needed variable for editing. After that, the editing field, where we can enter the constant value, becomes available. After entering the constant and choosing the sign of equality in the drop down list, you can see a preliminary result. to add the operation into the table of mathematical operations. 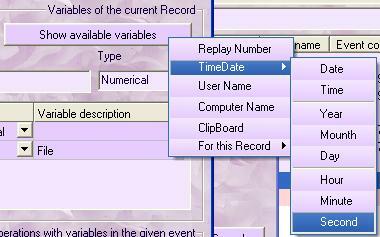 Now if you press the button "��", you may be sure, that the set operation will be fulfilled in the given action.